Keith Collantine has written a post about the Indy GP's chances of returning to F1 - and this has sparked the inevitable discussion of other feasible venues for a USGP. As the heart of American motor sport, Indianapolis is the place for F1 to be, but it is also true that the circuit is not one of the best. It may even have been made worse by recent alterations. Whenever alternative USGP sites are suggested, I see two conflicting problems brought up by the more practical of F1 fans: circuits in or close to cities tend to be too narrow and tight for GP racing and other circuits are miles away from anywhere. This is always mentioned as soon as anyone breathes the names "Laguna Seca" or "Watkins Glen", for instance. Yet, in the changing world of F1, is this really something that should be taken into consideration? The vast majority of F1 watchers do so through the television these days; in fact, gate receipts cannot begin to cover the cost of staging a GP. Which is why Bernie is so concerned about TV rights - this is where the big money is made. So why do we always insist that circuits be close to civilization? It's not as if the majority of those who attend races come from the nearest city - many fans travel huge distances to be present for the occasion. It may even be seen as part of the whole experience - the getting there and then wending one's way homeward after the race. Perhaps we should not worry too much about the difficulties involved in reaching remote tracks and instead we should be thinking in terms of the setting as seen through the TV lens. Personally, I like street circuits, mainly because buildings and tight surroundings give a circuit atmosphere. But it has to be admitted that cities with potentially great street circuits (Long Beach springs to mind but I believe they have neutered that one since F1 left) are few and far between. The remote tracks are the more likely option if we're thinking in terms of TV audience, therefore. The dedicated fans will attend wherever the GP is held. That has always been true and it will continue to be so. Why not choose circuits for their visual appeal and for the racing drama they can povide? Theoretically, there is no reason why a race should not be held in Alaska or Montana, provided the necessary facilities are provided for good television coverage. Of course, the conservationists might be stirred to action if we attempted something like that but places like Laguna Seca and the Glen are suitable sites as well. There remains only the expense of bringing such older tracks up to F1 standards. That is going to cost a bit and would have to be offset by allowing a percentage of TV receipts to go to the organizers. Bernie probably would not hear of such an idea but he won't last forever. And I have a feeling he won't be around for long once his sidekick, Max, leaves the scene. That Mosley business is an excellent opportunity for new blood and bold ideas to enter the sport, in fact. It is certainly about time we learned that motor racing is not only a money-spinner - it is fun as well. Looking again at venues for GPs that have been disqualified as uneconomic might be a part of balancing out the forces currently working on F1. And maybe, just maybe, we should be forward-thinking enough to see "televisability" as more important than accesibilty in the modern world. If I can sit in my living room and watch David Attenborough fooling about with gorillas in the the forests of Africa or see some crazed athlete assault Everest without the benefit of oxygen tanks, surely we can have GPs wherever we want them? Ahhh, the old tracks in the middle of nowhere conundrum. you're right about TV being the most important thing and fans in the stands be damned. Just look at Bahrain - very few in attendance and very few places for those attending to sit. The other issue is providing enough "swanky" hotels and other amenities to fulfill the needs of Bernie and the other F1 "swells." I understand that Bernie used to helicopter in to Indy from Chicago every day because nothing in Indy suited his overblown self image. The other issue, it seems to me, is that the tracks proposed here in the US (Watkins, Laguna, Road America) are just too interesting and challenging plus, there are places to pass on the natural road courses here. The new tracks designed by that German fellow all look the same, I have an idea that they are all designed to provide similar lap times, too! And as we hear every other weekend, the new tracks have no places to pass so we have the emasculation of F1 tracks. And then there's the $$$$ Bernie wants to put on a show. Great if your country is some dictatorship and you can just rob the treasury but that ain't going to happen here. At Indy there was a lot of whining about how the track had the longest section where the engines were flat out... well put on your thinking caps boys and figure out how to make the engine last. Same thing for natural road courses here - put on your thinking caps boys and figure out a way to make it work without taking the big $$$$ hit. I would love to see F1 at Laguna Seca - the MotoGP race there is my favourite of the season ! I think there needs to be some infrastructure in place so that the fans that do go have somewhere to stay etc Afterall a race run to empty grandstands - even if you are watching it on TV - lacks atmosphere. I know a lot of people who went to the Indy races loved it but the track is a bit Mickey Mouse. I would love to see F1 at Laguna Seca but they would need to do a lot to make it safe and it would probably still be impossible to run cars in anything close to their normal spec. I wouldn't be surprised if it was impossible to get an F1 down the Corkscrew without grounding out. It would take an awful toll on the driver's back. I am surprised you think Magny Cours looks good on the TV. I went there in the early 90s to see the World Sportscar Championship race. The place looked like it had just been built and still needed a bit of work. The big problem with isolated tracks is the lack of five star facilities for the VIPs. Agreed, Francois - Aida was a terrible mistake. But, when it comes to Magny Cours, I always think that, if you're going to have a French GP in the middle of nowhere, why on earth aren't you at Paul Ricard? And I mean the old course, with its mile-long straight! Rich: The matter of facilities at these boondocks circuits can be a problem, if we're talking five-star hotels for the rich and famous. Part of me wants to say, "Well, let them eat cake," but I suppose I have to accept that the hangers-on should be catered for too (Okay, metaphors all wrong but that was what came to mind). Do any of them make more than one visit to F1, however? And, if not, why should we be spending so much money to ensure they enjoy the experience? On second thoughts, let them eat cake! Peril: The thing about existing circuits is that they do have facilities already. Okay, they may be more primitive than the F1 set are used to but should not cost too much to get up to the standard required. And besides, being in Marie Antoinette mode (judging by my last reply), I can't help but feel it might be good for everyone to be reminded of how things were in the early days of F1. Let's call it an exercise in history! I have been wondering about for the first time. personally surprised Bernie didn't take the headshot for a clean kill instead of the messy and tentative hint of no-confidence he has given. Steven: Riccardo Zonta took a Toyota F1 for a few laps of Laguna Seca a couple of years ago as a publicity stunt - so it is possible. Yes, we know some changes will have to be made, including lengthening, to make the track acceptable to F1 but the Corkscrew makes it more than worthwhile. And surely it will cost less than building a circuit from scratch. I think you're on to something there, Peter. It all makes a lot of sense, although I favor more of a forced re-structuring of the FIA through pressure from the manufacturers. Tom Rubython's article about the underhand financial arrangements made by Bernie and Max has been getting a lot of attention recently and might just be the cause of some awkward questions being asked once Max has gone. At the very least, I would expect some form of inspection of those deals to be carried out. And once they get to that, who knows what will be revealed? Bernie should be sweating, I think. in turn broke this record to a 1:05.8.
and F1 are on twisty tracks like Laguna Seca. Perhaps I should have suggested disgruntled F1 teams switch to CHAMP en masse? only cede the power to the current twits by not acting collectively. And besides, it was a Toyota! The idea of a merger is unfortunately no longer possible, Champ Car having been as good as bought out by Tony George and merged with Indycars. I think in the future it might be an idea to look at a closer relationship between Indycars and F1, converging their technologies so that American open wheel racing and the European variety can eventually merge. It would take a lot of goodwill, understanding and vision, however, on both sides. That's spot on, Clive. They should switch to Magny Course. The facilities are already state-of-the-art, all the place needs is a bunch of hotels. Maybe Max can invest his $300 million Bernie Bucks in that, then Bernie can pay his owners $40 million a year, increasing by 10% every year, since he owns the course. It makes perfect sense. USGP should cast aside Indy and hold it in Las Vegas as a street race. The place rivals anywhere on the planet as far as places for the high-rollers and stuffed shirts to parade around looking far more important then they realy are. Well, there was some recent speculation that the Paul Ricard circuit could come back into play in spite of its remoteness. I say, if they've done it in the past, surely that means we can do it again, only better this time! Too far from civilization? I'm one of the very few who have raced at Watkins Glen during the USGP, albeit in support races and always as #38, nine years running. eight more times in my case. Indy cars, NASCAR and ALMS still race there for AMERICAN television cameras, but Bernie could never extract his price from that location. 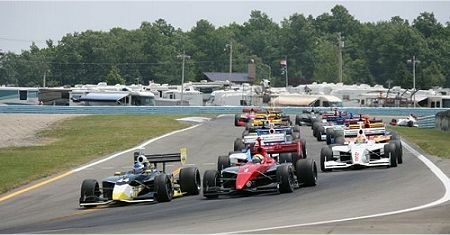 F1 will never return to Watkins Glen. Of the most recent additions to the calendar - Fuji, Istanbul, Shanghai, Bahrain, new Hockenheimring - only Istanbul has a corner worthy of the name. And even then it's out in the middle of nowhere. Calling it 'Istanbul Park' is a joke - it's an hour from the city on a good day. And the spectators facilities are shocking. Non-existant. So what you're saying, Keith, is that remoteness and facilities are not really criteria for selection of GPs - they are more like excuses when Bernie wants to drop a circuit? With that, I would agree and it is essentially what I'm saying. Money is what drives selection of GPs, pure and simple, and I don't think it should be that way. I know it will be so as long as Bernie remains in charge and it must always be a factor in considering GP venues. But other things (like corners!) need to be taken into account as well. So why do we always insist that circuits be close to civilization? Because of sponsors, that's why. F1, like all other forms of racing, are there to serve the needs of sponsors first and foremost. And sponsors don't want to be dragged to some track 3 hours outside of West Jesus, or stay in hotels that are substandard. Even worse, sponsors don't want to inflict that sort of thing on their honored guests that they're in the process of working multi-million dollar/pound/Euro deals with them. A US GP will never happen at Road Atlanta or The Glen or Laguna Seca or any other track like that. If it doesn't come back to Indy, it will most likely bounce around from one temporary street course to another, most likely Vegas would be in the cards. So money still rules, Tony. I'm not saying you're wrong but I do think it's worth looking for a better way. Those sponsors can drop the sport anytime they like and put their money elsewhere. F1 should be looking at more lasting methods of financing the sport. There are many existing Grands Prix that make your point rather well; nobody seems to be complaining about what a pain it is to get to Bahrain, Fuji, or Spa, so I think it shouldn't be that hard to get people to an inevitably Herman Tilke remodeled Laguna or Watkins. While I really wish and hope that IndyCar will open their spec in a way that allows new manufacturers to show interest instead of watching 22 identical dallaras with honda plants, the differences between F1 and Indy are now too great to ever really make them merge, with the big killers being ground effects (necessary for the ovals) and alcohol (present since CART days and banned from F1 as not being petrol, I don't think Tony George wants to get rid of the publicity stunt that running ethanol presents to his otherwise flat series). Good points, Chunter, although it might be time for F1 to think again about alcohol, it being a bio-fuel. It would certainly take a lot of negotiating to bring IndyCar and F1 together, however - I'm not sure that I hold out much hope for that one.